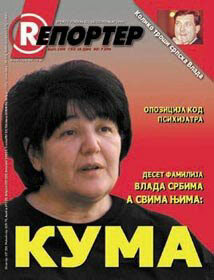 Bull's Eye: Reporter made Milosevic's enemies list with this cover dubbing Mira Markovic Serbia's "Godmother." By ordering the beating of protesters, Milosevic definitively identified himself as a ruler whose only obligations are to his own power. And in our schoolbooks, such a ruler is called a dictator. After two days of brutal police clashes with anti-regime demonstrators in Belgrade, a series of arrests and kidnappings, after the closure of the last company that printed opposition newspapers—after all of this, it is certain that you will never read the piece of news at the beginning of this article in the Serbian language. Not because it is impossible for these things to happen, but because there will be nobody to write about them: Those who could even manage to do so would hardly avoid being among those 300 that are to be gotten rid of. Last week, an open pursuit [of the opposition] was launched in Serbia. Reporter’s high-ranking Serbian police source claimed that Belgrade’s 22nd and 72nd police units, which for two nights had beaten at least 300 fellow townspeople, “were not ordered to crush the demonstrations, but were in a defensive action.” However, the fight between the opposition and the regime has entered the phase when both of them realize that in Serbia there is too much blood in vessels and too little blood on the pavement. The beating of demonstrators Wednesday night to prevent them from going to the district where Serbian politicians live showed that the police were more prepared to defend the ruins of the Yugoslav president’s former residence [destroyed in NATO bombings] than to prevent [then-opposition leader Zoran] Djindjic and his comrades from taking the buildings of parliament, state television, and a number of other institutions in the city center left to the demonstrators. Power in Serbia does not spend the night in institutions but in a single briefcase. Therefore, only from that briefcase could come the order to the police that not a single live protester should enter Dedinje [the district where Milosevic lived at the time]. And the following night, from the same briefcase, the police were ordered to prevent demonstrators from going over Branko Bridge, which connects New to Old Belgrade. The order was issued because only a few hundred meters from the bridge, in the Hyatt Hotel, the Serbian elite was celebrating a Chinese state holiday. The wife of the briefcase [Mira Markovic] attended the party. She was not supposed to see demonstrators because such scenes easily upset her. This time, the “defensive” police actions showed that there would be no relaxation, and that the briefcase that rules Serbia was more determined to defend its power than the opposition was to take it. Milosevic has demolished the parliament that chose him to be Yugoslav president. He also diminished the federal government. Even Montenegro, Serbia’s sister republic in the federation, does not recognize it. When a policeman came back from Branko Bridge and told his wife that he clubbed Zoran Djindjic, he probably had no idea that his boss had abandoned any obligation toward the opposition in Serbia, giving up any idea of somehow making a deal with Serbian opposition leaders. When Milosevic was indicted by the Hague tribunal and when the international community agreed that the only good Milosevic was a Milosevic out of power, he did not even feel obliged to the West anymore—the only power that during his 12-year-long rule he had to respect, at least periodically. Milosevic is a man who does not have a single institution behind him. Nor is he obliged to anything or anybody but himself to continue to rule at any price. There is no need for theory: The ruler who is obliged solely to his own power can only be called a dictator. So do not wait to see the news at the beginning of this article in the newspapers; look for it in the street or in your apartment. The beating of Belgraders was not a typical clash of the forces of order with demonstrators, because the police got their orders from Milosevic and had to obey them. The beating was proof that the bloodshed has started, and there is no way to stop it until either the dictator is fed or someone is fed by the dictator. Besides, Milosevic’s rule can be simply described: The intensity and amount of each use of force during these 12 years [of his rule] was proportional to the intensity and amount of his defeat. The fight between the opposition and the regime has entered the phase when both of them realize that in Serbia there is too much blood allotted to vessels and too little on the pavement. Therefore Seselj, who justified the beating of women by saying that “no woman is beaten without a reason,” is nothing more than a spokesman for the bloody retaliation of the dictator against his own people. Only first-class hypocrites, opportunists, and ignoramuses still believe that the situation can be resolved without corpses. There is consolation in the fact that the result is known: After each drop of blood spilled in the street, one more wife of a policeman will slam a cold dinner in front of her starving husband who came back from his beating shift. Following each slammed dinner, there will be one fewer man to answer Milosevic’s next call ordering another beating. The outcome of every dictatorship, even Milosevic’s, is an academic question. Expect casualties; everything else is in God’s hands and in the story written at the beginning of this article, which you will never read in the Serbian language.